I am not South African and I have only stayed in South Africa for a few months, but I know a lot about the country and am interested in what goes on there. There are several reasons for this, but the main one is that it is portrayed as the Canaan of Africa. South Africa is supposed to be the model African country. When Zimbabwe’s economy crumbled, South Africa became a source of hope for millions of Zimbabweans who risked limb and life illegally crossing the border. Most who crossed into South Africa will tell you a different story now they are there, though: the grass is definitely not greener on the other side. Recent events have rubbished the perfect image of South Africa. All of South Africa’s problems seem to emanate from the huge gap between the rich and the poor, a division which is mostly along racial lines: whites are rich and blacks are poor. According to the South African Institute of Race Relations, the white per capita income is nearly eight times higher than that of blacks. The rich black people are too few to be of any help in trying to bridge the wealth gap; they are mostly politicians or those connected to politicians. The results of a nationwide census earlier this year were released recently and it was announced with a sense of shock that the financial divide between black and white is huge. In reality this is hardly a huge reveal: everyone has always known it. The nationwide strikes in the mining sector, the transport sector and so on tell the story of an angry black majority. The strikes tell the story of a black majority buried so deep in the vicious cycle of poverty that they don’t see a way out; they are prepared to die while demanding that they receive remuneration that will allow them to live in dignity. And they have been dying. South Africa needs transformation and it needs radical transformation. Addressing young people at a youth leadership summit in Harare, Zimbabwe, recently, the Zimbabwean Minister of Indigenization and Economic Empowerment, Saviour Kasukuwere, said: ‘a revolution cannot be led by sane people.’ South Africa needs leadership that will realize that the ‘willing buyer, willing seller’ formula of land redistribution does not exactly work in a country that has millions living in shanty towns. South Africa cannot and should not, however, take notes from Zimbabwe’s President Robert Mugabe on how to carry out land reform. As much as land reform was necessary in Zimbabwe, the methodology used was way too chaotic; its purpose was to enrich a few top dogs. South Africa needs transformation and soon, but is the South African model of black empowerment too polite and full of loopholes to do any good? South Africans are disillusioned because the end of apartheid was, perhaps, an end in name only. 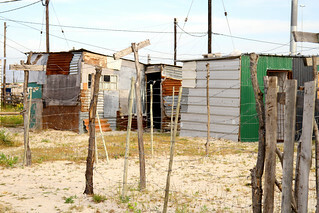 Most black South Africans have seen no real benefits since the end of apartheid some 20 years ago. While we might all celebrate that the South African rugby and cricket teams are in the top five globally – the South African cricket team is currently ranked first – these money-spinning sports are dominated by whites. Surely blacks can run with an oval ball and swing a cricket bat – if they are given the opportunity to do so – a means, perhaps, to fish their families out of poverty. Have the politicians forgotten why so many died at the hands of the apartheid army and police? Did Mandela and others spend all those years in prison for nothing? If something had been done as soon as a black government got into power, we would now have cricket and rugby teams in which half the players were black. Who can blame South African workers if they carry spears and knobkerries and declare war on a capitalist and racist system that has condemned them to shack-dwelling in their own country?